Fr. 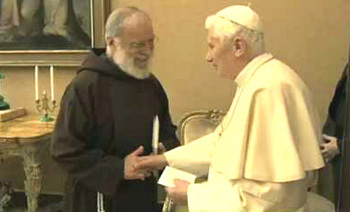 Raniero Cantalamessa was chosen by Benedict XVI to be the official Papal Preacher. As such, in theory he delivers sermons to the Pope and the Roman Curia on what they should do to be better Catholics and achieve sanctity. In practice, if Fr. Cantalamessa is independent and truly speaks as his own man, his role is similar to that of a prophet who orients the Pope and the Cardinals on the path of Progressivism. If he is not independent, then he is an emissary who receives instructions from Benedict to deliver the latter's messages on solemn occasions. Cantalamessa gave a sermon to Pope Francis and his Curia during the Good Friday ceremony on March 29, 2013 at St. Peter’s Basilica. Since his position as preacher will end when Francis chooses his own staff and replaces him, I believe the preacher’s message was suggested by Benedict XVI, as a kind of mission passed on to the Pope who entered active duty. Installing a new notion of mission: Mission is no longer a conquest, as the Church always conceived it, which was duly reflected in the Propaganda Fidei, the Congregation for the Propagation of the Faith. Mission now is the explicit denial of what that Congregation did. Instead, it is an affirmation of a free and joyful invitation without any pressure to accept. Knocking down the walls that divide “Christians”: We know from John Paul II’s Encyclical Ut unum sint (nn. 88, 92, 95) that he and then Card. 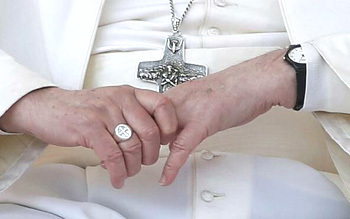 Ratzinger, who helped to pen it, considered the Papacy to be the main obstacle for the union of “Christians.” So, the message is to finish with the Papacy as a Monarchy and make it – along with the entire Church - “linear.” A linear, horizontal or collegial Papacy is the dream of Vatican II, where the Pope is not a Sovereign, but a primum inter pares, the first among equals in the colleges of the Bishops and Cardinals. It was under the pretext of avoiding an “excess of bureaucracy” that the marriage annulment processes were transferred from the Sacra Rota Romana to the diocesan tribunals. The end result is undeniable: an explosion in the number of annulments, which became so easy to attain that they represent the virtual establishment of divorce among Catholics. With this change, the Sacra Rota lost an important function, facilitating the way to its abolition; the morality of Catholics deteriorated; divorce was de facto admitted, and the conciliar Church became more similar to Protestantism. Under the pretext of collegiality and eliminating bureaucracy in the Vatican, the processes of beatification and canonizations are being transferred to the diocesan tribunals. In Benedict’s last phase and now with Francis, we are seeing beatifications and canonizations being proclaimed no longer in Rome, but in France, Spain, Argentina and Brazil. If this continues as planned, the ‘saint factory’ established by JP2 and continued by B16 that produces an increasingly larger number of saints and blessed – more than what was made by all the other Popes together – promises to explode to unimaginable proportions. This explosion would represent such a depreciation in the honor of sainthood that it would reduce it to practically nothing. Again, this would make the conciliar Church more akin with Protestantism, which denies the saints. Thus, the pretext of eliminating excess bureaucracy has already been used, first, to destroy the monarchical centralization of the Church, second, to destroy the identity of Church morals and worship, and third, to protestantize the Church. Doing away with the remains of past ceremonies that became debris: This vague aim can encompass all Catholic traditions and symbols. 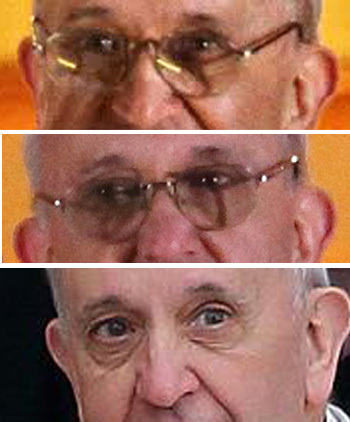 We have seen the despisal Pope Francis has revealed for every symbol of the Papal Monarchy - he reportedly said “the carnival is over” minutes after his election when asked to wear the red papal mantle, he refused to use the papal golden ring and cross, red shoes, papal throne, papal apartments, papal limousines, etc, etc. This goal of doing away with “past ceremonies that now are only debris” is so generic that I wonder what it does not include. Any ceremony or custom can be abolished under this pretext. Another question: Who will judge when a ceremony has become “debris”? Will it be Pope Bergoglio with his patent egalitarian criteria? Will it be the Prefect of the Congregation for the Doctrine of Faith, Archbishop Muller, a partisan of Liberation Theology? Will it be the “Great Eight” that Francis has already chosen to direct the Church with him? No one knows. Why should there not be an age limit on a Pope for governing the Church, like the one that was set for Cardinals? Why not a time limit on papal government like what the presidents of republics have? Why not end the secrecy of the papal election to correspond to democratic procedures? Why not include in the papal conclave other representative persons, bringing in the Presidents of Bishops Conferences, the Superiors of Religious Orders and representatives of some influential lay associations? Why not end clergy celibacy? Could it not also be considered “debris”? Why not admit women to the priesthood? Why not admit that laymen can consecrate the Eucharist? After considering laws that could be debris, now let me look at two examples of questions that arise about the disputes. Can the doctrine of justification that separates Catholics from Protestants be considered a dispute-debris that needs to be removed? Can the dogma of the Faith that Our Lord is God - which separates Catholics from Jews and Muslims - also be considered a dispute-debris that prevents the longed-for Pan-religion from being achieved? 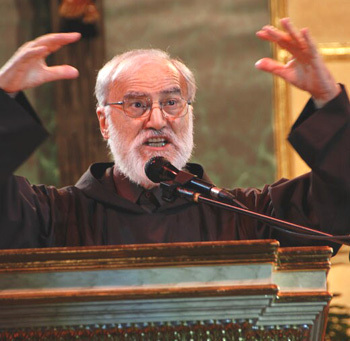 Removing institutional obstacles: Cantalamessa used many metaphors to say that almost every hierarchical aspect in the Church institution no longer meets modern needs and have become an obstacle. This sermon seems to me a full carte blanche given to Pope Francis by Pope Benedict to do whatever is necessary to try to destroy everything in the Church that prevents the utopia of Vatican II from becoming a reality. The plans are thus on the table. 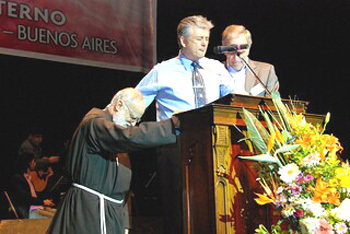 To carry them out, Pope Bergoglio counts on the obvious support of Pope Ratzinger, all the Cardinals who deliberately elected him, the ensemble of Bishops, the immense progressivist majority of Catholics in the Church, a great part of the conservative minority that always wants to be fooled, plus the whole media and the totality of Freemasonry and Judaism. This is an apocalyptic power to accomplish the impossible and infernal task of completely destroying the Catholic Church. If this picture is objective, what is lacking for us to be living in the times of the Antichrist?